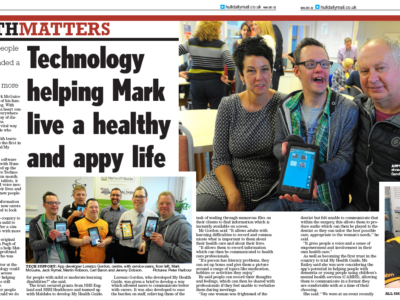 My Health Guide features in Hull Daily Mail – Maldaba Ltd.
Maldaba’s app for learning-disabled adults, My Health Guide, features in a two-page article in Hull Daily Mail. It’s great to have such positive coverage of the project from an independent journalist, who captures well the overall picture. My health Guide isn’t about clever technology: it’s about changing people’s lives on a daily basis. This external confirmation of the hard work that everyone has put into the project so far is much appreciated. You can read more and see the full article on the My Health Guide website.